Researchers from the University of Michigan and Ford Motor Co. have assessed the global availability of lithium and compared it to the potential demand from large-scale global use of electric vehicles. The research findings, published in the current issue of the Journal of Industrial Ecology, conclude that sufficient resources of lithium exist for the next 90 years to supply a large-scale global fleet of electric vehicles through at least 2100. The researchers compiled data on 103 deposits containing lithium, with an emphasis on 32 deposits that have a lithium resource of more than 100,000 metric tons each. Lithium is a key ingredient in the development of certain types of batteries, and is a key element of batteries used in hybrid and all-electric vehicles. The data collected included deposit location, geologic type, dimensions and content of lithium, as well as the current status of production. Using the definition of a lithium "resource" as a deposit from which production is currently or potentially feasible economically, the researchers estimated a global lithium resource of about 39 million tons. 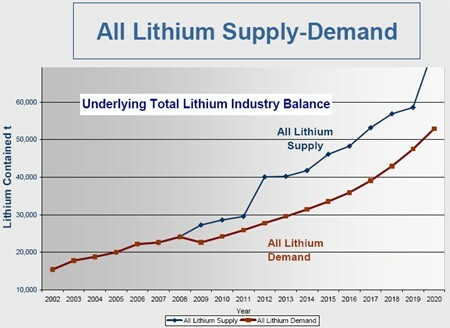 The second part of the study examined lithium demand for the same 90-year period (2010-2100). Demand was estimated under the assumption of two different growth scenarios for electric vehicles and other current battery and non-battery applications. Areas studied related to demand were lubricating grease, frits and glass, air conditioning and portable batteries, as well as batteries for hybrid electric, plug-in hybrid electric and battery electric vehicles. The total demand for lithium was estimated to be in the range of 12-20 million tons, depending on assumptions regarding economic growth and recycling rates. "Even with a rapid and widespread adoption of electric vehicles powered by lithium-ion batteries, lithium resources are sufficient to support demand until at least the end of this century," the researchers conclude in the paper. The study's main authors were Paul Gruber and Pablo Medina. They conducted the research as part of a graduate student research project before graduating in 2010 from the U-M School of Natural Resources and Environment. The research partner was Ford Motor Co., the global automobile manufacturer based in Dearborn, Mich.
"We believe our assessment is a timely and comprehensive study that settles the question of whether the global resources are sufficient for electric vehicles using lithium-ion technology," said Gruber. Other co-authors were U-M professors Gregory Keoleian of SNRE and Stephen Kesler, a professor emeritus of geological sciences, and two researchers from Ford: Mark Everson, the technical leader of the Manufacturing and Purchasing Strategy research group, and Timothy Wallington, technical leader of the Sustainability Science research group at Ford's Research and Innovation Center.